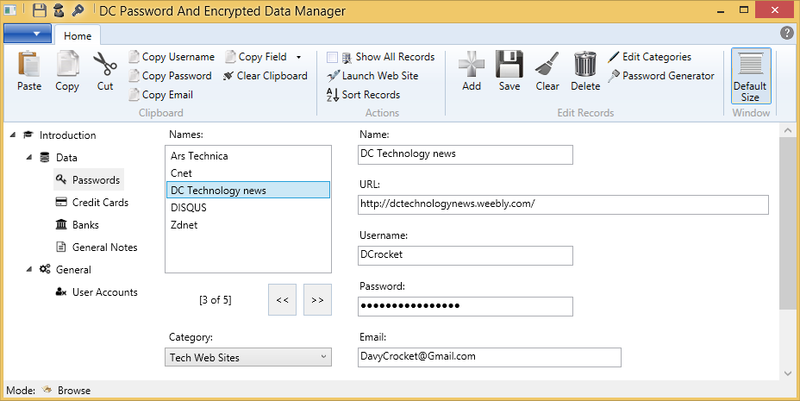 DC Password And Encrypted Data Manager Doc - Creating A Record - Douglas Computing, Inc.
To create a record, click on the Add button on the ribbon bar at the top of the screen. (Note: for you to be able to do so, the application needs to be in Browse (vs. Edit) mode.) Next, fill in the information for your record. (Please note that you must enter a value into the Name field, and the name you provide for your record, has to be unique - otherwise the application will notify you of your error.) After you have entered the data for your record, click on the Save button on the ribbon bar, to save your record. When you do this, the name for your record will appear in the Names list box. Please note: if after beginning to create a record, you decide to discard it, you may click on the Clear button on the ribbon bar in order to do so.